Celebrate wines from some of Washington’s newest and most exciting wineries. These nine women owner/winemakers have joined together to offer an evening of wine-tasting fun. These extraordinary women come from diverse backgrounds. From assisting top winemakers in the state, to new breakout winemakers changing careers to follow their passions, they have received multiple magazine write-ups including a Top 100 in Wine Enthusiast, Sunset feature, 425 Magazine and lots of 90+ scores. Their wines are as varied as the ladies and they represent the growing number of different varietals and styles available from WA. Come join us for an unforgettable evening of community, entertainment and wine. P.S. The winemakers are women, but all drinkers welcome. Date night, ladies night… fun for all! 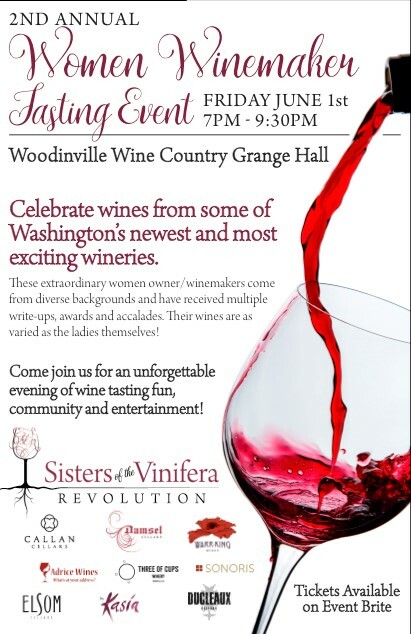 Belle & Bottle Events is proud to present this event sponsored by Woodinville Wine Country with proceeds from ticket sales to benefit women in Washington wine. Belle & Bottle focuses on engagement between the local wine & spirits community and the rapidly growing market of customers. Partnering with top leaders in the industry, the goal is to create unique offerings and memorable experiences that showcase the passion and skill of local artisans.